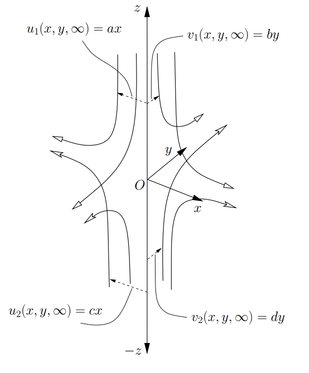 The paper “Impinging Howarth stagnation-point flows” co-authored by Matt Turner and Patrick Weidman (Univ of Colorado at Boulder) has been accepted for publication in the European Journal of Mechanics B/Fluids. The paper presents new exact similarity solutions of the Navier-Stokes equations consisting of two impinging Howarth stagnation point flows. Numerical solutions are given to the resulting coupled ODE system and are presented for differing strain rates at infinity. The author final copy of the paper can be found here.